Jennifer's been kidnapped! Now's your chance to prove you're a sharp-shooting detective by helping Jennifer's father find the five diamonds that will pay her ransom. You'll use your Zapper light gun to blow away anything that gets in your way. But even with the Zapper, this case will be hard to crack. Because not only are the diamonds hard to find, but you only have 24 hours to find them! What's more, you'll have to think fast and shoot even faster, because ferocious monsters, diving airplanes and hungry man-eating sharks will stop at nothing to prevent you from getting to the diamonds. Think you're a sharp shooting detective? Well, you better be. 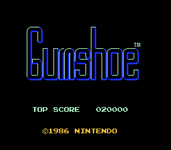 Because if you're not, it's curtains for you in this quick-on-the-trigger Nintendo Light Gun game!